It’s been a week since I returned from my second Grand Meetup adventure and now that some of the tireds have gone away, it’s time to reflect and recap. Last year, I wrote this post about my first Grand Meetup and this year, I told myself I would do a better job of journaling during my trip so I didn’t forget things. It’s not so much the events that I worried I would forget, but my thoughts and feelings and experience. Alas, I wrote two entries, one on the plane on the way there and one at the very end late at night in my hotel room. You see, the Grand Meetup (GM) is a pretty consuming affair, with days packed full of projects, learnups, flash talks, and activities; evenings packed full with dinners and workshops; and nights packed full with parties and social time. There’s not much time for introspection or journaling without suffering from FOMO. And I don’t wanna miss a thing at GM. This year, more than 250 of us met in Park City, Utah at the Canyons Resort. Park City was quaint and gorgeous and the resort was fabulous! The staff was great (and they all seemed to think we were pretty great too). The rooms…omg, the rooms. The smallest of them still had a full kitchen, dining room table, a fireplace, and couches (my room and view are pictured below). The largest were the party suites we booked on the top floor. One of my teammates Dennis writes here about his seven crazy nights staying in one of the suites. If you follow Automatticians on Facebook, Twitter, Instagram or other social media, I’m sure it looks like Grand Meetup is one big giant party. It is, but we do get an amazing amount of work done too. At each GM, we choose whether we want to work on a project or pursue professional development (this year, we could also just choose to do our normal jobs). It’s pretty amazing to see what small groups of Automatticians can do in the span of just a few days in terms of launching new tools and features, learning code, and generally getting ‘er done. We had some more social or casual “workshops” too, covering things like photography, book discussions, free writing, sing-alongs, movie/sports/TV viewings, video gaming, and this year, the Scottish independence referendum. Ah, yes…activities! This is where your social media feed gets clogged up with pictures of us having crazy fun times! One of the hardest things about GM is choosing which activities to do. You can’t do them all, mostly because many of them are offered at the same time and also because GM is a marathon that requires you to pace yourself so as not to overdo it and exhaust yourself. The list of available activities is bottom-up, meaning that no one at the top decides what we will do. Any Automattician is free to plan and coordinate an activity that they’re interested in and open it up for others to join in. 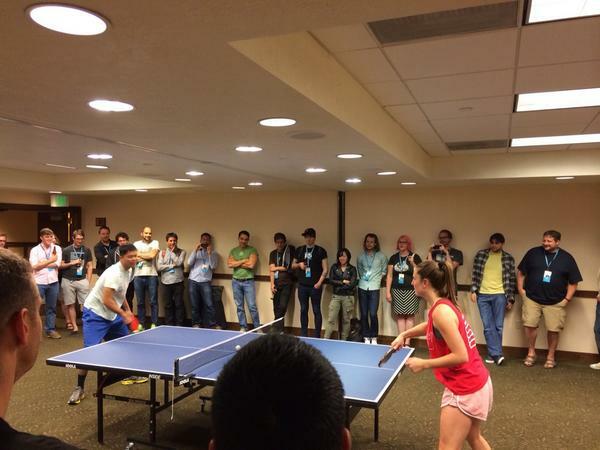 Throughout the week, several Automatticians also competed in a very spirited ping pong tourney (a GM tradition). You know you work for and with some very fun people when one of the logistical priorities for the meetup is to bring in a ping pong table and secure a space suitable for games. With the list of fabulous options to entertain ourselves at each GM, it might appear to be hard to pick my favorite one, but it’s really not. My favorite activity of all is one that doesn’t appear on any list and requires no signups or reservations. It’s called “hanging out and chatting with my coworkers”. This can happen anywhere – poolside, outside the conference room, or in one of the several party suites we booked this year. Some of my favorite memories are just of times spent socializing with people. If I haven’t already mentioned this, Automatticians are a friendly, funny bunch with diverse backgrounds and interests. Just talking with them is entertaining and informative. Inevitably, like all good things, GM must end. Each time a meetup ends, I feel relieved and sad all at the same time. Relieved because I miss my family (and sleep!) while I’m away. Sad because I know I’ll miss my coworkers once I go back home. For most of them, GM is the only time I get to see them face-to-face. Another Automattician captures this feeling so well in her post The Fog of Sadness (I already miss your laugh, Lori! ).